At Southpointe Dental, our Red Deer dentists offer a variety of general dentistry services for you and your family. We provide amalgam-free dental services including preventive, restorative, and cosmetic treatments to improve teeth health and smile. Dental crowns are a type of restoration that covers or “caps” the entire visible region of the tooth to create a healthy smile. We offer white bonded fillings that blend into the natural colouring of your existing teeth for a natural-looking smile. Regular check-ups every six months are an important addition to your regular daily brushing and flossing habits. 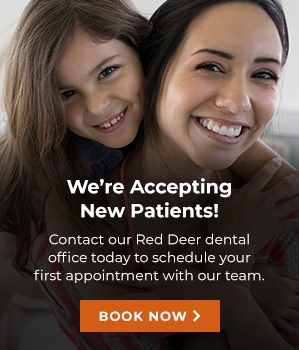 If you work or live in the Red Deer area, book your next appointment at Southpointe Dental! I'm excited to start my dental career with Southpointe Dental, and I look forward to caring for the dental health of the Red Deer community. Contact your family dentist in Red Deer today! At Southpointe Dental, we offer a variety of dental services for you and your loved ones. Read these tips if you are unable to see a dentist right away. Interested in dental sedation? Learn more about the options available to you. Learn more about wisdom teeth and the services we provide. Contact your Red Deer dentists to make an appointment. Whether you're a new patient or an existing patient, looking to book your regular check-up or have an inquiry about cosmetic services, wisdom teeth removal, or other services, we'd love to hear from you.